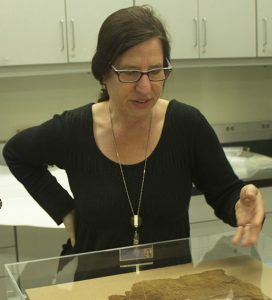 One of the Getty Villa’s most fascinating objects, a 2,000-year-old mummy, continues his journey. 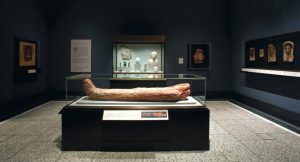 At the Getty Villa we have an important resident on view in our galleries: a Romano-Egyptian mummy. An inscription above his feet identifies him as a Roman citizen named Herakleides. Herakleides lived in Egypt 2,000 years ago when the Romans ruled, adopting past Egyptian traditions and introducing new ones. Egypt was a melting pot of different customs and cultures, not only Romans and Greeks, but also many other groups from the Near East. All these societies intermingled—and Herakleides is clear proof of this. He was mummified in the traditional Pharaonic method: eviscerated, desiccated, and linen wrapped. Reflecting the classical Greco-Roman tradition, a portrait on a wooden panel captures the likeness of the man within the red-shroud. This “new” style of preparing the dead for the afterlife in Roman-ruled Egypt results in a rich document, an image of someone who lived in the 1st century A.D.; an ancient snapshot. Herakleides’s portrait, delicately painted using the tempera technique, shows a youthful man wearing a gold wreath. His body, meanwhile, is encased in linen, painted red from head to toe and decorated with traditional Egyptian funerary iconography depicting figurative and amuletic motifs. 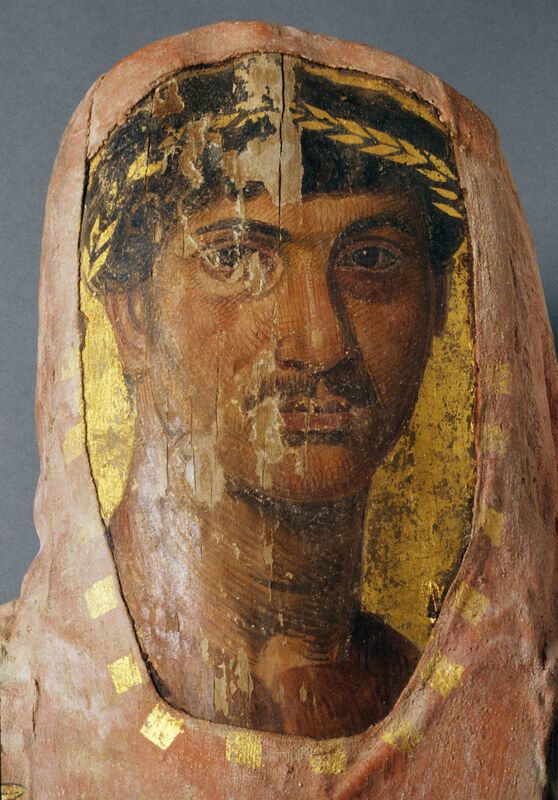 The Getty Museum acquired this special mummy in 1991. We had many questions about him that technology—until recently—could not answer. To know more about who was inside the mysterious wrappings, from 2004 to 2006, we conducted a technical and scientific investigation. Now, in preparation for the reinstallation of the Getty Villa galleries and Herakleides’s visit to the Getty Center for the exhibition The Classical World in Context: Egypt (March 27–September 8, 2018), his story is worth sharing again. Conservators and conservation scientists from the Getty had the opportunity to study Herakleides’s mummy, inside and out. 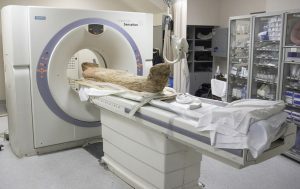 The exploration started by taking him to UCLA’s David Geffen School of Medicine, to be CT (computerized tomography) scanned. This technique captures and combines a series of cross-sectional X-radiographic images, allowing the interior of the mummy to be seen from every angle. 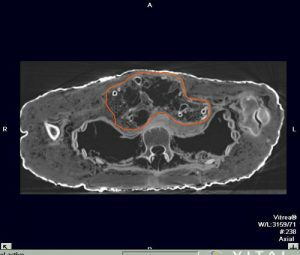 In viewing the CT data, the first discovery we made was that Herakleides was around 18 to 20 years old when he died, as determined by the stage of his bone development. Although this may seem untimely, death at such a young age in antiquity was more common than one would expect, especially without the benefits of modern medicine. The CT scan also revealed that Herakleides’s partially eviscerated, desiccated, and resin-soaked body lies flat on top of a wooden support board. This board was most likely used for ease of handling during the mummification process, but because wood was rare in ancient Egypt, the use of such a large plank must have been a luxury. This discovery, along with the exceptional quality of his painted portrait with gilded details, supports the conclusion that Herakleides was a young man of high social status. The CT scan further presented an unexpected surprise, a mummified ibis within the shroud wrappings. The ibis, an Egyptian wading bird, symbolized the god of writing and magic, Thoth. 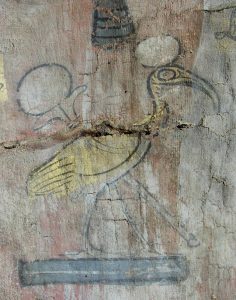 The bird was placed above Herakleides’s abdomen between the linen wrappings, to accompany and protect him in the afterlife. The bird’s inclusion within the wrappings may also be a clue as to who Herakleides was during his lifetime: certainly a very special person. He may have been an educated man, or involved in the cult worship of the god Thoth, perhaps even a priest of Thoth, highly regarded individuals in ancient society. While we were examining the mummy, we also had an opportunity to study the materials used to create it, such as resins, paints, and pigments. 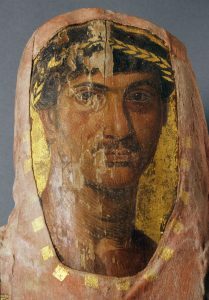 Scientists at the Getty Conservation Institute identified the paint covering Herakleides’s shroud as being made of the pigment red lead mixed with beeswax. Red lead is a man-made pigment that is relatively simple to make: Heat lead to a high temperature in air. But by examining the trace elements present within the red lead on Herakleides’s shroud, it became clear that this particular red lead originated from Spain, and furthermore, is possibly an example of ancient recycling. Lead was used in the refining of silver, and after it exceeded its usefulness for that purpose, evidence suggests it was turned into the pigment red lead. This pigment is interesting for two reasons. First, its origin sheds light on the extent of trade at the time: Pigments were not necessarily produced locally, but were transported as part of an extensive trading network across the entire Mediterranean region. Second, its composition matches a small group of other red-shroud mummies from Roman Egypt, possibly identifying a workshop (group of artisans) that imported and used the same red pigment. The mummy of Herakleides has been on view in Gallery 206 at the Villa since 2006. Due to the current work to reinstall the collection, Herakleides will go temporarily off view on March 8 and return on April 24—alongside the related Romano-Egyptian mummy portraits that are included in another scientific investigation—in redesigned Gallery 210, Portraits in Roman Egypt.